The Dallas Mavericks announced their 2018-19 local television schedule today, which includes 79 regular-season games on FOX Sports Southwest. FOX Sports Southwest’s coverage of the 2018-19 season tips off on Oct. 17 at 9:30 p.m. CT, as the Mavericks travel to the desert to take on No. 1 overall pick Deandre Ayton and the Phoenix Suns in their season opener. The network will also televise the Mavericks’ home opener against the Minnesota Timberwolves on Oct. 20 at 7:30 p.m. CT, with coverage set to include a 90-minute Mavericks Live pregame show at 6:00 p.m. CT.
FOX Sports Southwest will carry all four of Dallas’ matchups with the two-time defending NBA champion Golden State Warriors (Nov. 17, Dec. 22, Jan. 13, Mar. 23), as well as all four meetings with instate rival Houston (Nov. 28, Dec. 8, Feb. 11, Mar. 10). The network will also televise the Mavericks’ three showdowns with LeBron James and the Los Angeles Lakers (Oct. 31, Nov. 30, Jan. 7), and the team’s four matchups with Russell Westbrook and the Oklahoma City Thunder (Nov. 10, Dec. 30, Dec. 31, Mar. 31). 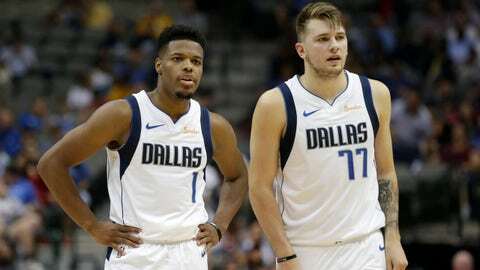 Additionally, all Mavs games televised on FOX Sports Southwest will be streamed on the FOX Sports app, which is available to iOS and Android devices, and provides live streaming video of FOX Sports content along with highlights and instant alerts for scores and key plays. Fans can download the mobile app for free from the Apple App Store and Google Play. Streaming on the FOX Sports app is also available on connected devices, including on AppleTV, Android TV, FireTV, Roku and Xbox One. Mark Followill returns for his 14th season as television play-by-play announcer for all FSSW telecasts. Former Maverick great Derek Harper is back for his eighth season on the telecast as the team’s color commentator, while Jeff “Skin” Wade enters his 10th season as an analyst. FOX Sports Southwest’s comprehensive coverage includes Mavericks Live pregame and postgame shows, as well as a bi-weekly Mavericks Insider magazine show.